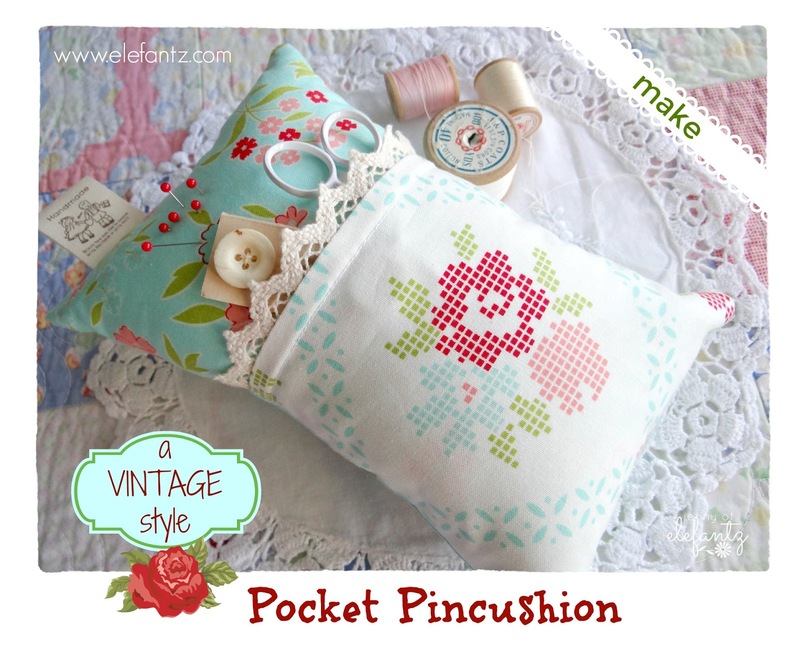 Did you make your own version of this pincushion tutorial I shared last week? Good, because today I have a new one for you to play with! 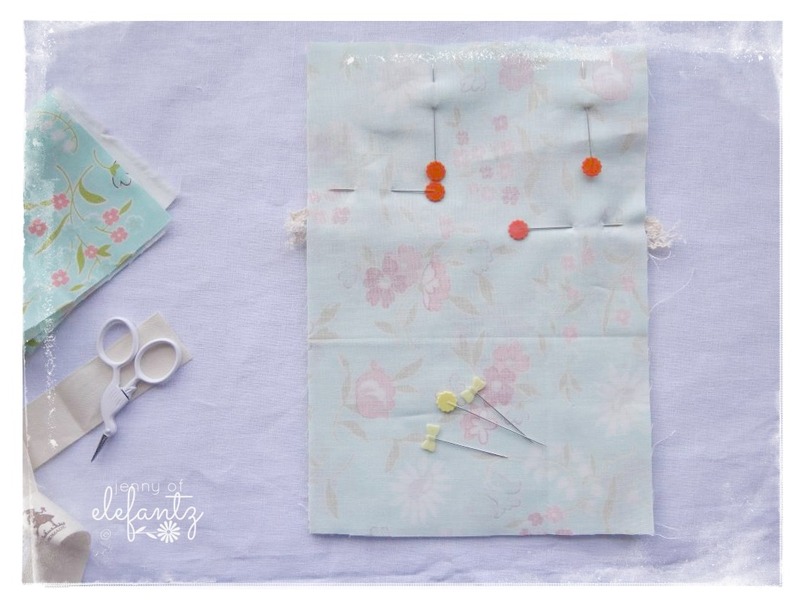 You don't need to use a stitchery for the pocket section of the pincushion, though that does make it extra special, but what about fussy cutting a piece of fabric instead? 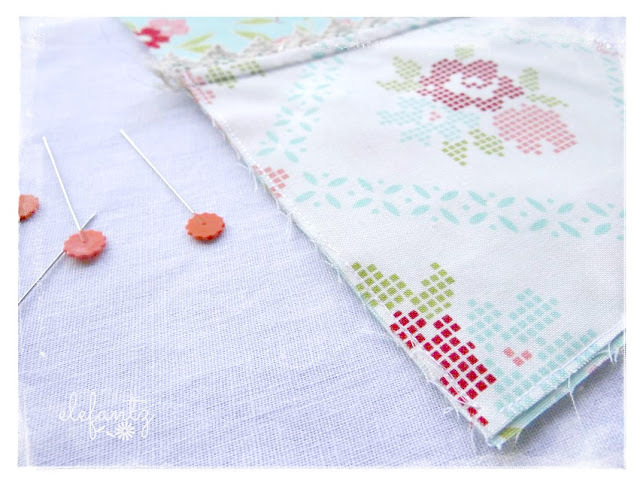 I've used a pretty faux cross stitch rose print from Bonnie & Camille's 'Vintage Picnic' fabrics (by Moda) to good effect on my second version of the Pocket Pincushion. Have a hunt through your stash for something special that you could use as a feature print for your pocket. PHOTOS - sorry about the quality of the tutorial photos. The glare through the sewing room window the other day was unbelievable. Mr E has since installed wonderful curtains. I love my man! I began with two, 5 1/2" (high) x 6" (wide) pieces of fabric and a 7" length of cream cotton lace. 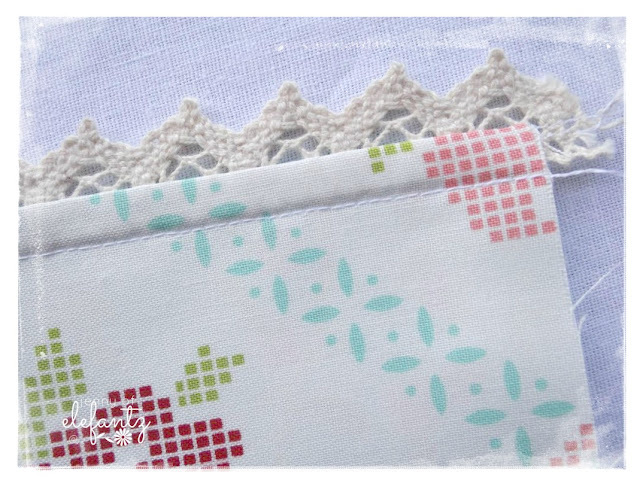 Sew the flat edge of the lace across the top right 6" edge of your 'fussy cut' fabric with an 1/8" seam. ...and fold away from the lace. Press flat with your iron so that the lace stands up. 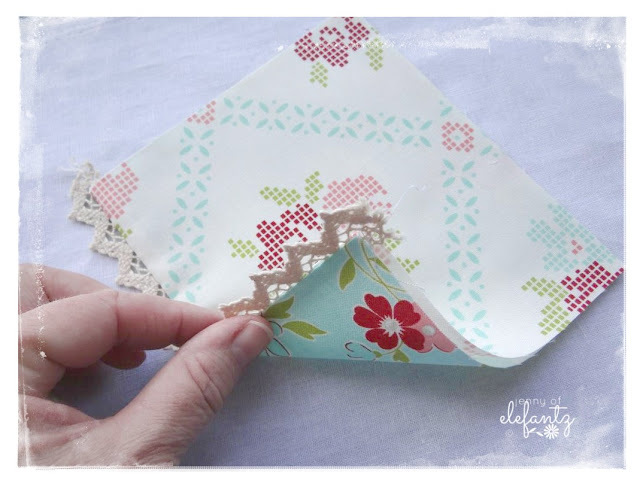 Sew a 1/4" seam under the lace edge. 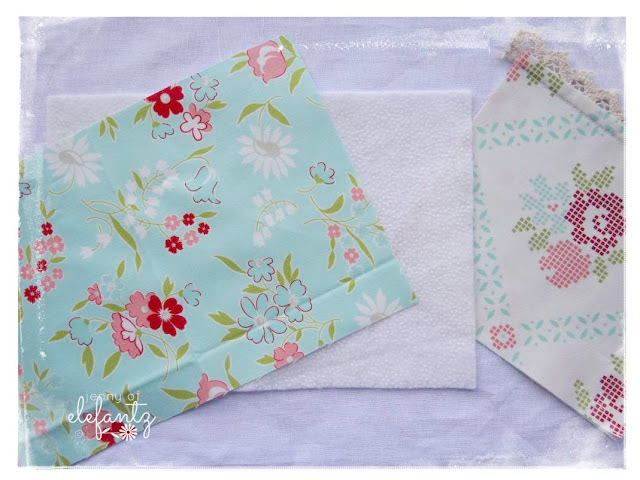 Cut a 6" x 9" piece of fabric the same as your pocket backing fabric. Cut a 6" x 9" piece of thin fusible Pellon or Parlan. 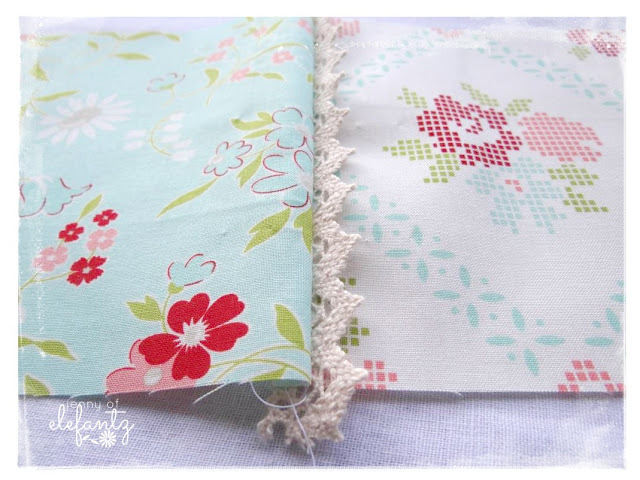 Fuse the Parlan behind the fabric. 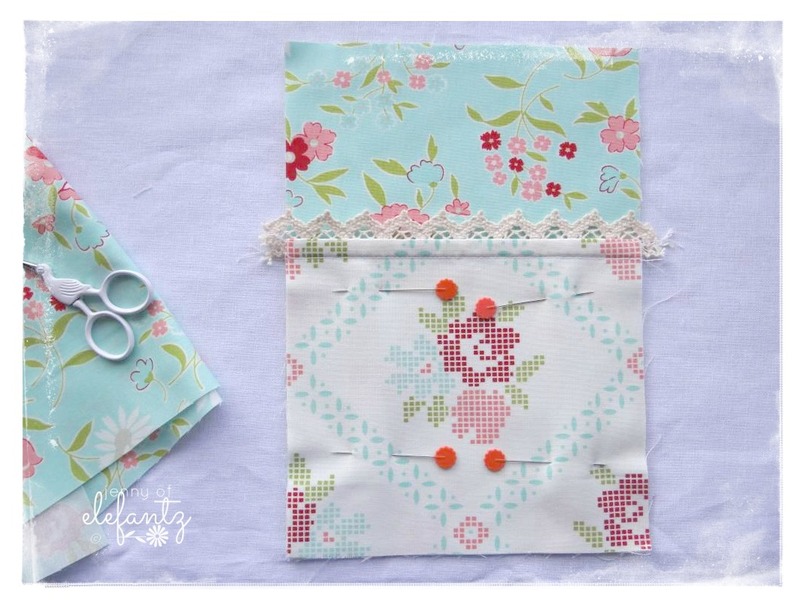 Pin the pocket to the bottom edge of the 6" x 9" fabric rectangle. 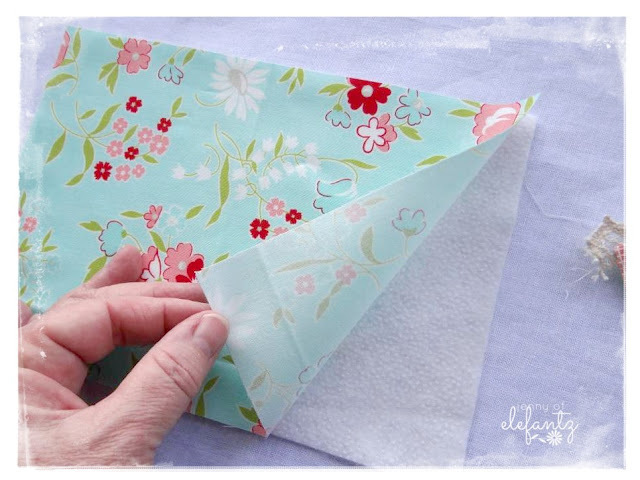 Sew around the three outer edges with an 1/8" seam. This is the front of your pincushion completed. 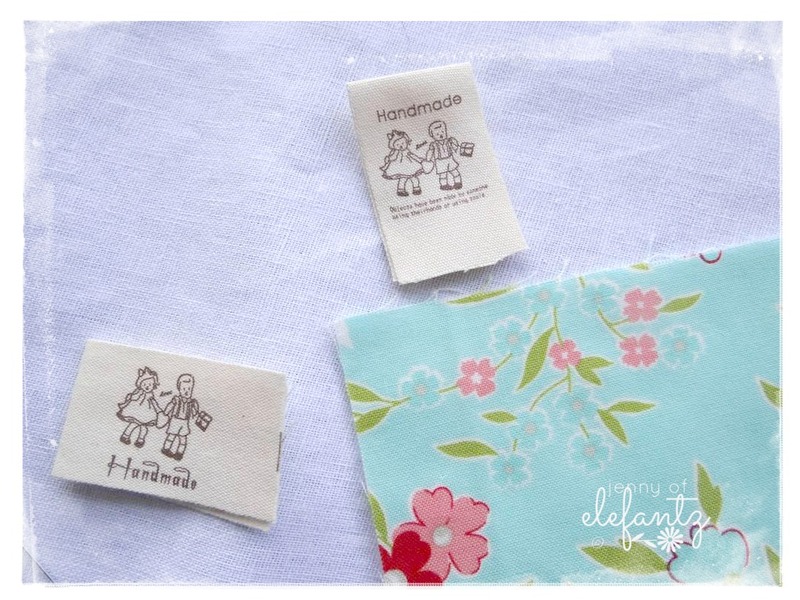 OPTION: I chose to add a little 'handmade' loop tag at the top of my pincushion before sewing the front and back together. 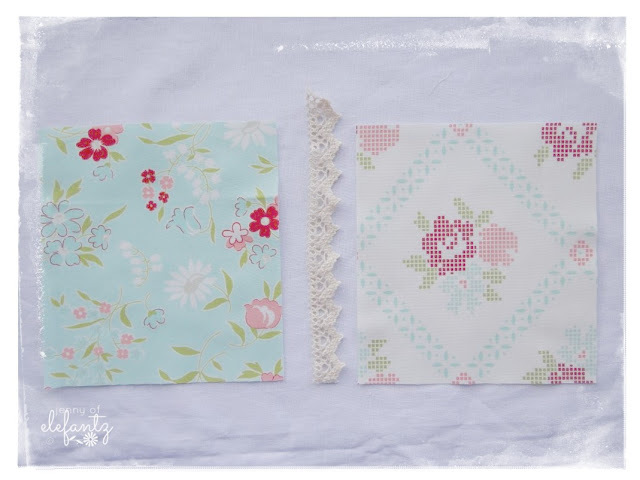 These are fun additions if you have them in your notions stash. Cut a piece of fabric (I used the same fabric as the front) 6" x 9" and lay it right side down on your pin cushion front. Pin all around, but leave a clear marker of 3" across the top. 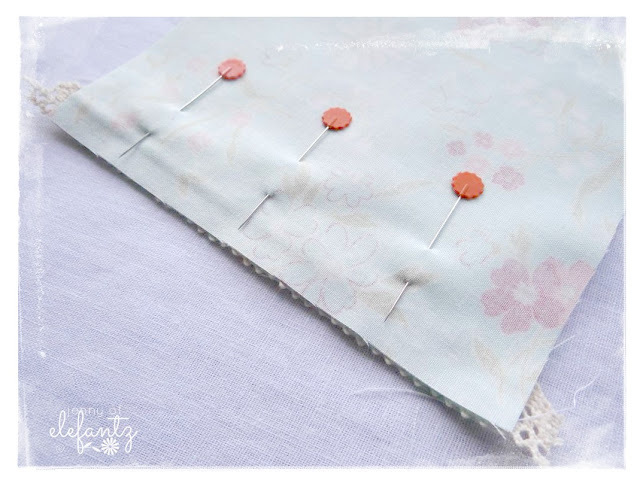 Sew the front and back of your pincushion together with a 1/4" seam all around, leaving that 3" gap open for turning out. 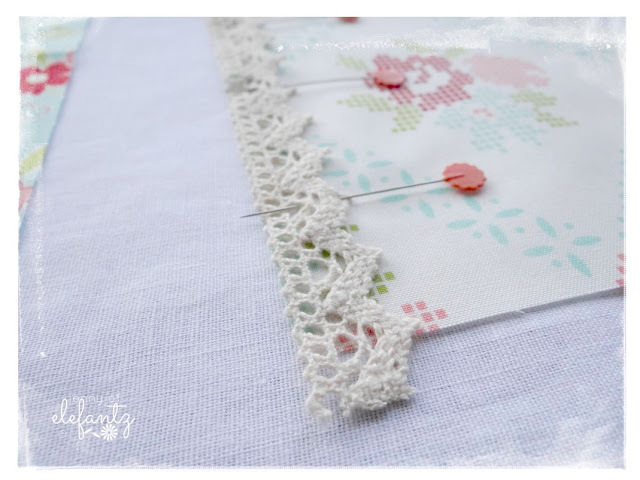 Trim the excess lace from the side edge. 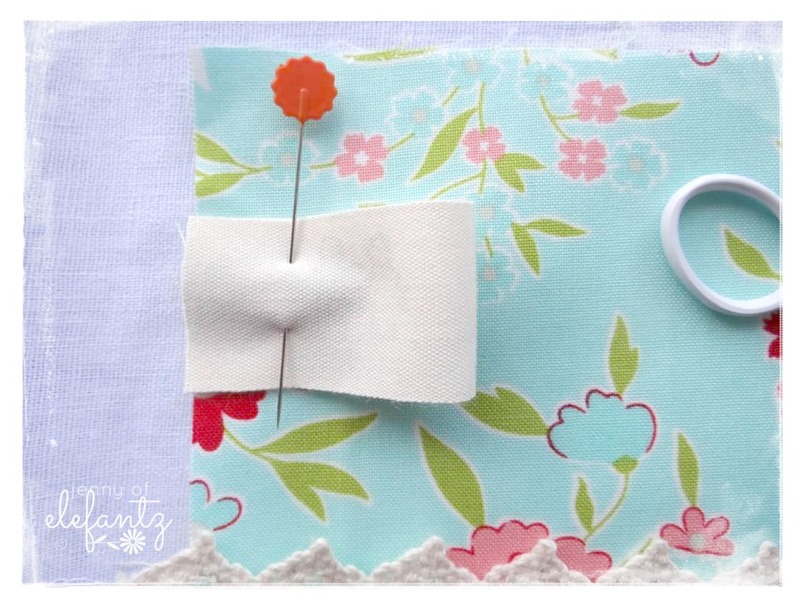 Turn the pincushion right side out through the opening, using a large rounded tool to push out your corners (I use a big wooden knitting needle but a chopstick is good too). Fill with stuffing, and slip stitch or ladder stitch the opening closed. Ta da! You have a sweet new pincushion for using or gifting. Once you've made this pincushion you'll find it quick and easy to make a few more so they become wonderful projects for your gift basket. I think a lovely hexie flower would be cute on the pocket too, don't you? Perhaps the recipients name or initial, a few vintage buttons? What would YOU display on the pocket? 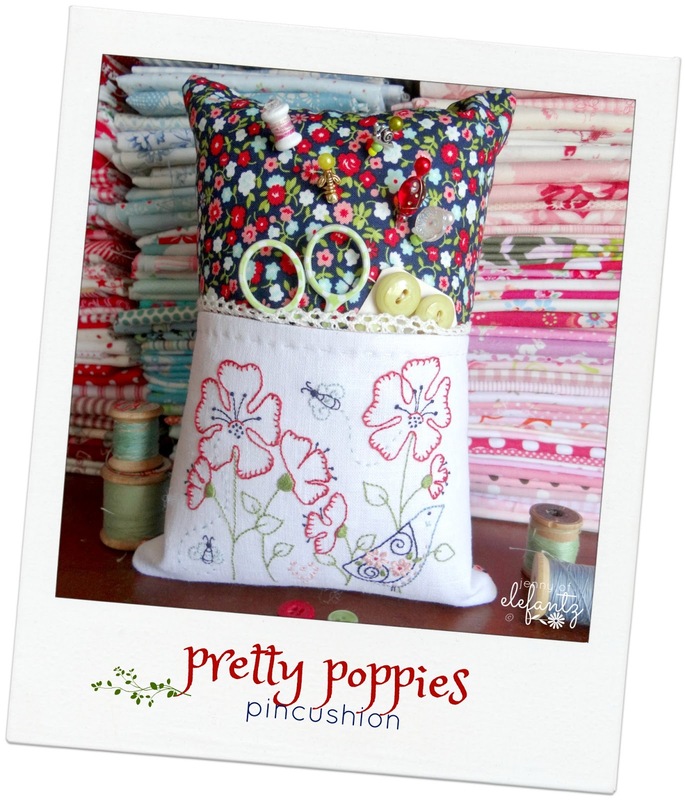 I've still got two more pincushions to show you before the month is out. Hope you're enjoying making them! I know I am. This is so sweet and lovely! What special gift ideas! Your posts always make me happy! Thank you! Jenny, Thank you for this tutorial. My sister and I are always looking for ideas for older girls (10 - 14 years) as we pack shoe boxes for Operation Christmas Child each year. 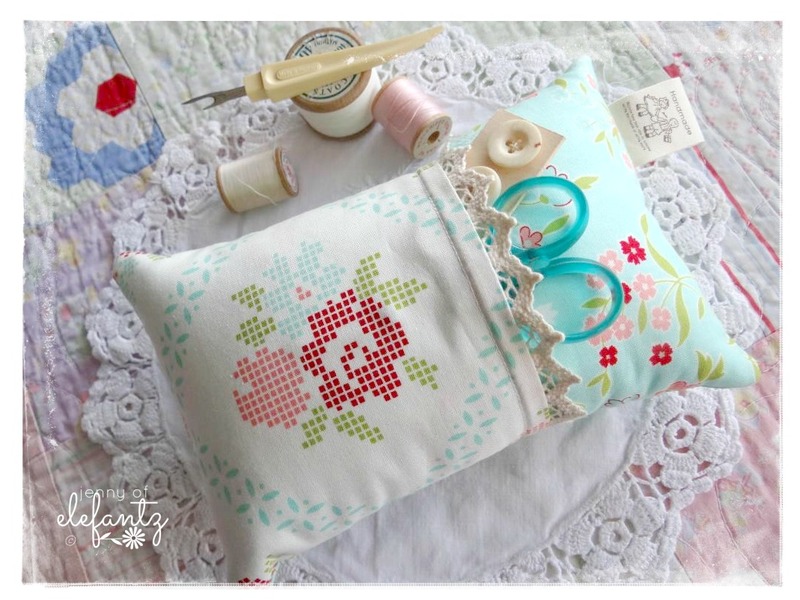 This pin cushion could be just what we are looking for. Thank you so much for sharing you thoughts, gifts and talents with us. You are such an encouragement in a world where, it seems to me, people strive to be anything but who they really are. Your blog has helped me accept that it is ok to be a stay at home mum and that I should be grateful that I can be at home for my children. Be blessed Jenny. Another sweet project. I can see myself making a few for some stitching friends this Christmas. Thanks so much for sharing. Thank you for yet another wonderful tutorial. Take care, Guida. What a lovely idea... 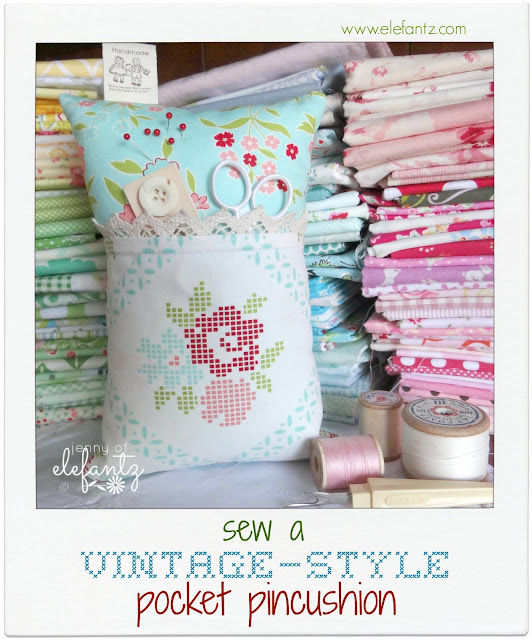 I am looking to make some gifts for a new sewist ... She us just ten years old and this is perfect. Thank you. Thank you, Jenny! Very nice! Jenny Dear this is a very sweet pincushion and Thank You for sharing your easy tutorial. 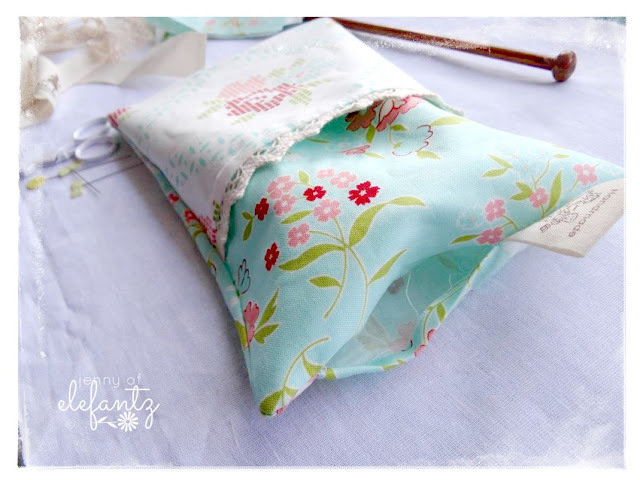 I can see making these little "pillows" for dolly beds and a sweet note tucked inside. I can also see these as sachets with a gift card or cash in the pocket for the recipient. 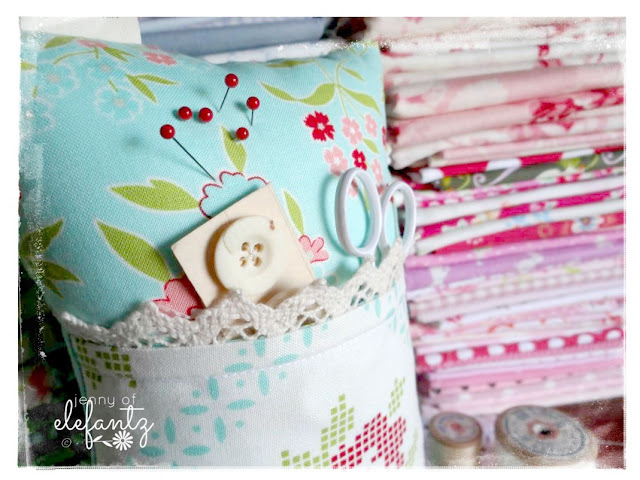 If only I had my sewing station available. You are amazing!